One-piece back, rough-arched, ready for purfling. Two days ago, I worked the thick plate from 35mm down to 29mm, and decided to start from there on the rough arching. 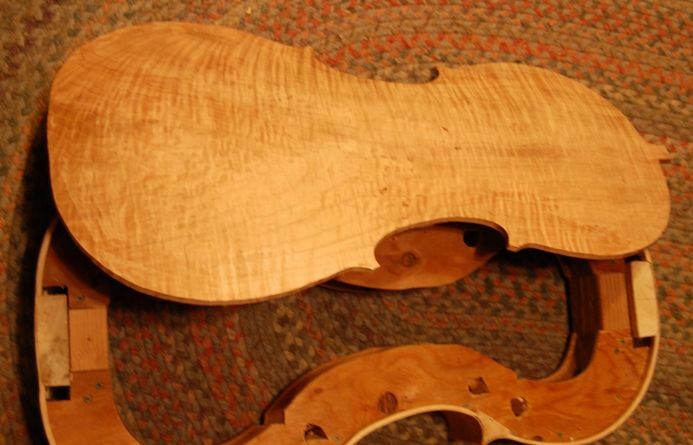 I may bring it a little lower yet…I haven’t decided yet just how high I want the back arching on this cello. I am thinking a little higher than the last one. The original Davidov is pretty flat…I may still emulate that curve. Tonight I simply worked a flat area all the way around the plate, at about 6mm (which I had marked ahead of time with a marking gauge), and then used a variety of tools to bring the shape of the plate to a “cello-shape”, though still a little plump. Edge-thickness marked with marking gauge. 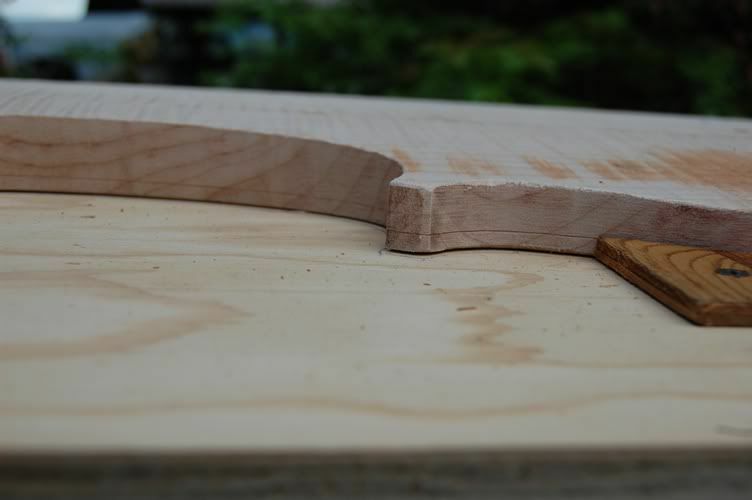 This (above) is actually a photo from the previous cello…I forgot to take a photo of the edge mark on this current cello before I began carving. Once I have the edge shape exactly the way I want it, I will probably take it down to 5.5 or even 5mm. The 6mm mark was just a good starting point for rough work. I ran a ball-point pen around the groove, too, after scribing it with the marker, so I could see it more easily, as it was sort of dark out in the shop. So, this is how it looks now. Rough-arching completed–almost ready for purfling. Once the edge is exactly the shape and thickness I want, I will mark the purfling groove location, and begin cutting the groove for the purfling. Once the purfling is completed, I can finalize the outside arching before beginning the inside carving. When this is completed, it will be a maximum of 8.5mm-9mm in the center area, fading out to 4mm or so around the flanks, and back up to 5mm at the edge itself. I have a long way to go. It is certainly pretty wood, though. That is always encouraging.